The Portable Remote Controlled Light can be put almost anywhere. Hang it in the closet on the closet rod with the built-in hook. Or mount on the wall with the included wall mount plate. Perfect for basements, attics, dark hallways, closets, etc. 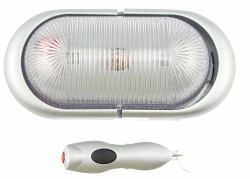 The light turns on with a simple push or with the remote control (perfect if the light is mounted in a hard to reach location). This amazingly useful light requires 4 AA batteries that are not included. It measures 6-3/4" x 3-1/4" x 2".